South Africa's Stormers had to scrape a draw against Japanese newcomers the Sunwolves in one of the surprises of the Super Rugby season, and England-bound center Kurtley Beale left on a stretcher in the first minute of New South Wales' win over the Bulls on Saturday. In the penultimate game of the 12th round, the Lions rebounded from conceding 50 points to the Hurricanes in their last game to dismantle the Blues 43-5 with seven tries. The Crusaders, Chiefs and the defending champion Highlanders, all from New Zealand, are level on 37 points and have the best records across the competition's four conferences. The Hurricanes are a point behind those three after beating Queensland 29-14 in Saturday's opening game. The bonus-point win moved the Johannesburg-based Lions top of the South African group, and New South Wales took over from the ACT Brumbies at the summit of the Australian conference. The Lions replaced the Stormers, who needed a last-minute try by prop Vincent Koch to avoid a huge shock in Singapore. 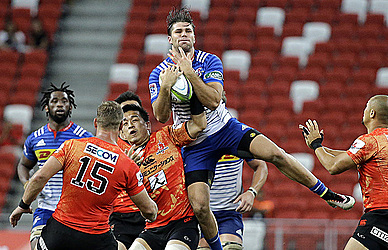 The Sunwolves, with just one win all season, scored the first try through wing Akihito Yamada. They led 14-3 at halftime but couldn't quite hang on as lock Pieter-Steph du Toit and then Koch went over for the Stormers in the second half. Replacement Brandon Thomson needed to kick the last-gasp conversion to level the scores. New South Wales Waratahs overcame the first-minute loss of Beale to easily beat South Africa's Bulls 31-8. A day after signing a multi-million-dollar, two-year deal to join Wasps — reportedly making him the richest player in English rugby — Beale landed awkwardly on his left knee on the newly laid surface at Sydney Football Stadium and was taken off the field on a stretcher. Initial reports suggested he sustained a tendon injury and there are doubts if he will play for the Waratahs again this season. The Waratahs picked up a bonus point with a try to replacement prop Angus Ta'avao with 90 seconds remaining, moving them into a point ahead of ACT. It was the third consecutive home win by the Waratahs over a South African opponent. Even without five senior players because of disciplinary suspension, the Wellington-based Hurricanes had too much for Queensland Reds to also collect a bonus point. The Hurricanes didn't have All Blacks Cory Jane, Julian Savea and Victor Vito, backrower Ardie Savea and prop Chris Eves, who were stood down for one match for breaching team curfew during the recent tour to South Africa. Wes Goosen and Jason Woodward, who replaced Jane and Julian Savea on the wings, shared three tries as the Hurricanes kept their playoff hopes alive with a five-tries-to-one home victory. While a crumbling scrum and the goalkicking of flyhalf Beauden Barrett remained a concern, the Hurricanes were able to prey on mistakes from the Reds. In the driving rain in Johannesburg, the Lions scored the first of their seven tries after 56 seconds in an early onslaught that floored the Auckland-based Blues. Captain Warren Whiteley touched down for that opener before flyhalf Elton Jantjies produced two masterful attacking kicks to create the next two tries for wing Courtnall Skosan and center Rohan Janse van Rensburg. The Lions were 19-0 up after 11 minutes. Center Lionel Mapore then scored a second-half hat trick. The Blues needed 73 minutes before their first and only points with a try to replacement Joe Edwards. "We have no excuses. We let ourselves down today, we know that," Blues captain James Parsons said. "We'll have a good look in the mirror." The Cheetahs beat struggling Southern Kings 34-20 in their South African derby, and Argentina's Jaguares were hosting South Africa's Sharks later Saturday to close out the round.